512 seeds in a tray. Lettuce, spinach, onions, leeks. Things a farmer needs in tonnage, get them started and then replant them. In the ground. 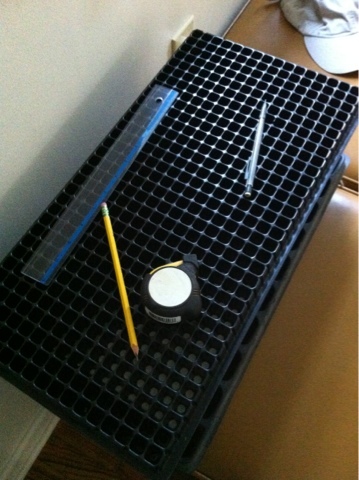 This tray would cause carpal tunnel pretty quick if it were planted by hand. It seems vegetable growers have purchased systems that operate a vacuum to get seeds inserted into a tray this size...estimated cost: $15,000. We will not grow enough of the tiny seeded, transplantable vegetables in our lifetime to justify such an expense. But we don't want carpal tunnel either. And onions we use by bagful, and have not figured out how to grow. Really want them, but onion "sets" are usually hybrids, the ones we want to grow are teeny tiny seeds. With a 40 share CSA membership 512 of any one thing will last us about 3-4 weeks at most, and we have a 26 week delivery. Plenty of time and space are all we need! Homer is working on a system that will get these planted quickly and efficiently for about $50. So far what he has built is working beautifully: we have carrots sprouting at a fantastic rate, even in the heat of summer. Onions, grown here. Can't wait. It's a year away, but that is how farming is..things take time to grow before harvest can happen.